and Pott’s Crocosmia (Crocosmia pottsii). Both of these are splendid South African flowers, members of the Iridaceae or Iris family, and they were combined by the plant breeder Victor Lemoine in France in 1879. 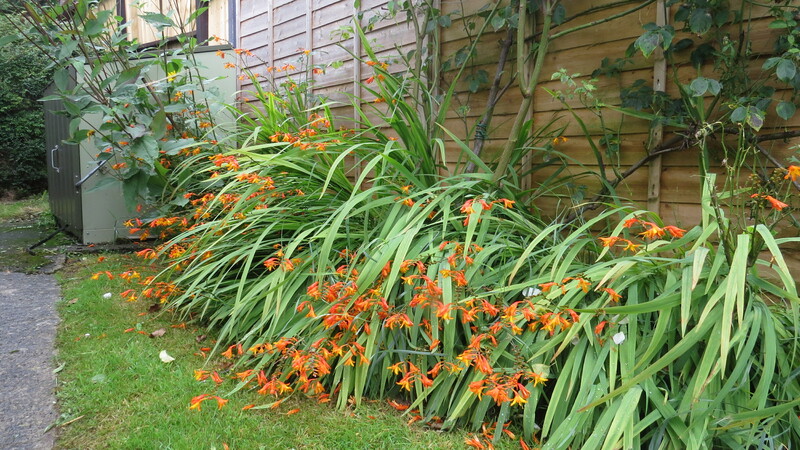 The thing about the montbretia that we’ve grown to know and love is that it quickly spreads to form the clumps that are much appreciated in the garden, but rather less so in the wild places of Dorset or Devon, Anglesey or Sutherland (where it is the fourth commonest alien plant, after sycamore, ground elder and lady’s mantle). In ‘Alien Plants’ by Clive Stace and Michael Crawley, it’s noted that although the plant can set seed, it spreads more often by means of horizontal rhizomes (underground stems), and that the plant seems to prefer the damp climate of our Atlantic coasts. 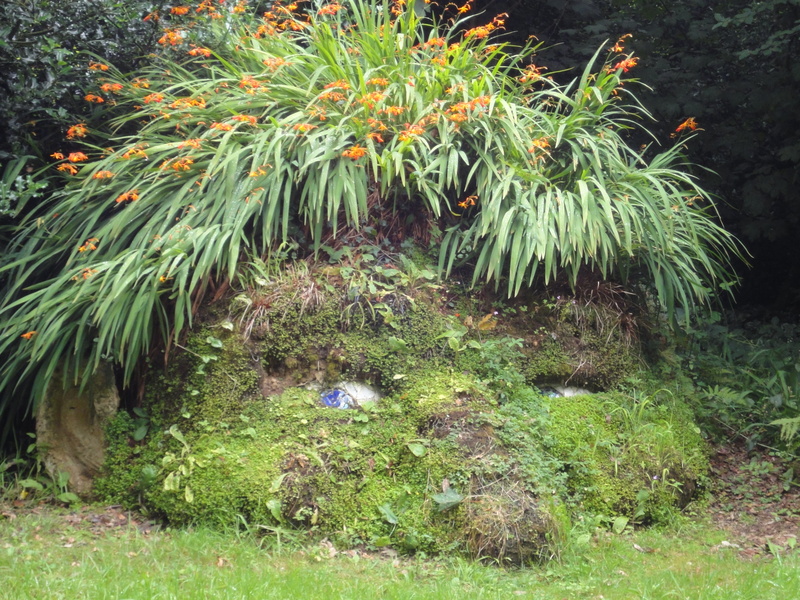 To see how dense a carpet it can create, have a look at the troll’s head from the Lost Gardens of Heligan in Cornwall (below) – the troll’s hair is entirely formed of Montbretia. 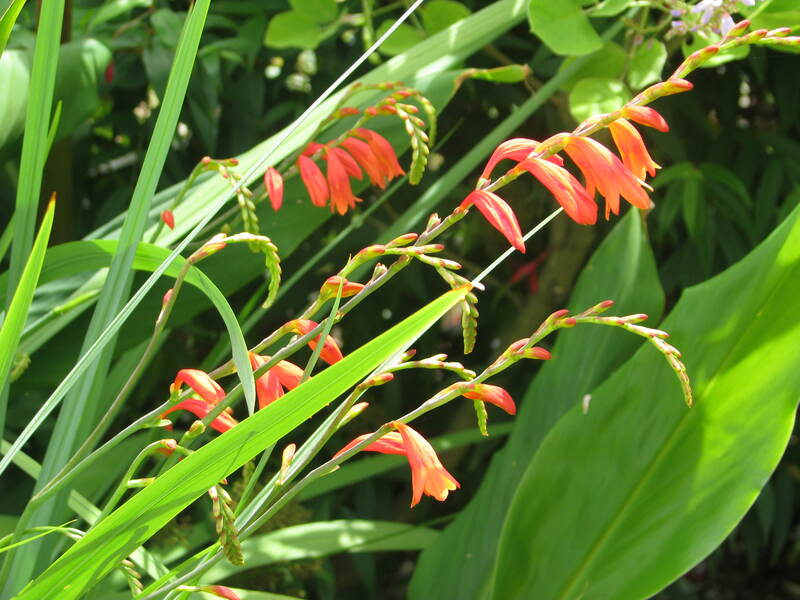 Montbretia is also a remarkably resilient plant, which survives being thrown out by gardeners. When I’m in Coldfall Wood, I’m often horrified by the garden waste which is just thrown over the fences of the houses that surround it. I’m sure people don’t realise the harm that can be done by this random ‘fly-tipping’ of plant material. It’s true that the woods are not as ecologically sensitive as some habitats, being full of aliens already, but it would be nice if we could preserve what we still have. Montbretia seems to come in two colours: the orange and yellow variation that Mum and Dad have, and a much more scarlet version. I always thought that flowers of this colour were largely pollinated by sunbirds and hummingbirds, but a bumblebee was burying itself in the flowers when I was observing earlier this week, so it is clear that insects have learned how to take advantage of the pollen and nectar. 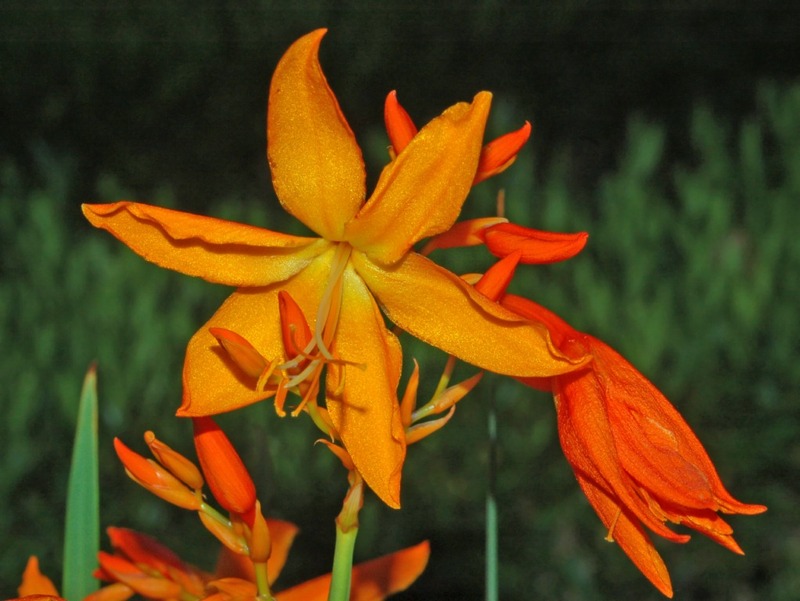 The Latin name Crocosmia might lead you to think that this plant is a member of the crocus family. However, it comes from the Greek words for ‘saffron-odour’ – the dried leaves are said to smell like saffron when immersed in hot water. The name ‘Montbretia’ comes from the name of a French botanist A. F. E. Coquebert de Montbret (1780–1801). 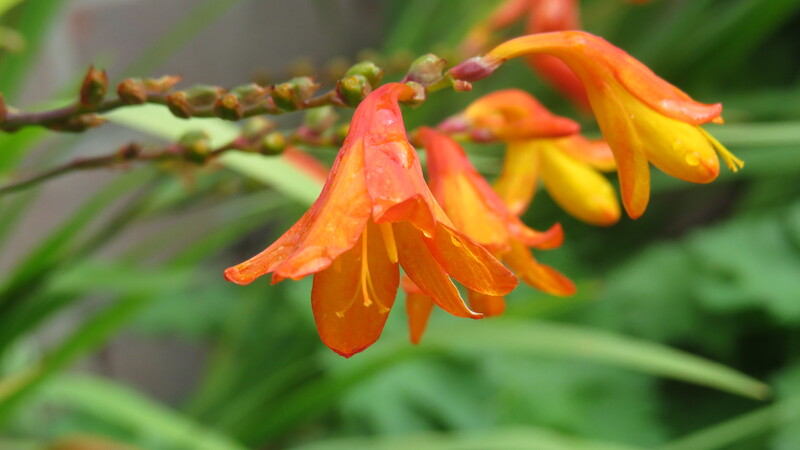 One advantage that Montbretia has over other plants is that it is very tolerant of, and may even prefer, high rainfall (hence its love of the west coast). Certainly, after a day of unremitting rainfall last week, the plant looked positively cheery. I expected to find no medicinal uses for Montbretia as we know it -after all, the plant didn’t even exist until 1879. 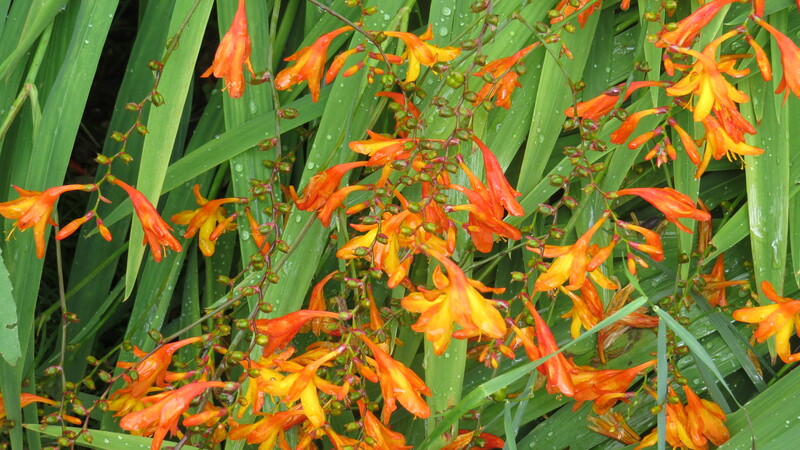 However, Pott’s Crocosmia, one of the ‘parents’, is a Zulu medicinal plant called Undwendweni, used to treat infertility (and thanks to 21stCenturyNaturalist for the information). Valentine flower (Crocosmia aurea), the other ‘parent’ is used to treat dysentery and diarrhoea. Valentine flower blooms can be used to produce a yellow dye for use as a food colouring. In Papua New Guinea, where Montbretia is a recent ‘alien invader’, the crushed leaves are used as a treatment for a head cold by being sniffed like snuff. I am always surprised at where my research for this blog takes me. Meet HMS Montbretia, a Flower-Class Corvette. These ships were built for the Allied Forces during World War Two and were used specifically as anti-submarine convoy escorts. All of them were originally named after flowers, so we have HMS Convolvulus and HMS Coriander, among others. I note that those made in other countries were often named something more belligerent – the Canadian navy had ‘Cobalt’ and ‘Drumheller’ for example. These were relatively slow, lightly-armed ships, intended to be quick to produce. They were mostly built in the smaller shipyards around the country, as the larger ones were already at full capacity. They were, however, very ‘wet’ boats: you couldn’t get from the front to the back without being drenched, and by 1941 they held twice as many crewmen as they were designed for, with men sleeping on lockers and tabletops. They were also known as ‘the Pekingese of the seas’ because it was said that they would ‘roll in wet grass’ – they wallowed so badly that even experienced seamen succumbed to nausea.It would have been a tedious, wet, uncomfortable assignment, especially as there was no room for fresh food so the sailors subsisted on hard tack and bully beef, just like in the good old days of the Royal Navy. 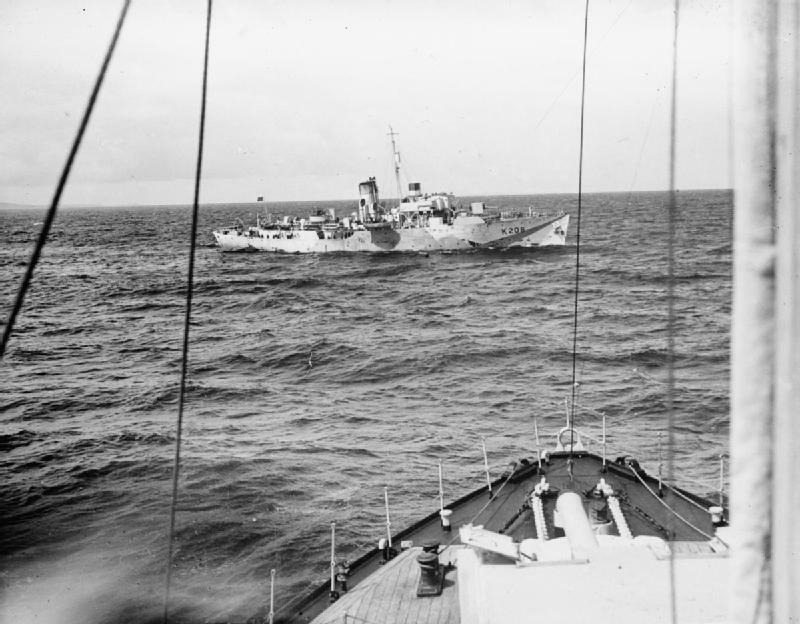 Nonetheless, the convoys largely got through, and the Flower-class corvettes were a major reason why. HMS Montbretia was built in Paisley in 1940, but in 1941 the Royal Navy sold her to the Norwegian navy. On the 18th November 1942 she was torpedoed by a German U-Boat with the loss of 48 lives. Last week, I went to see the film ‘Dunkirk’ and so the thought of men lost in the cold, dark sea is especially vivid to me. 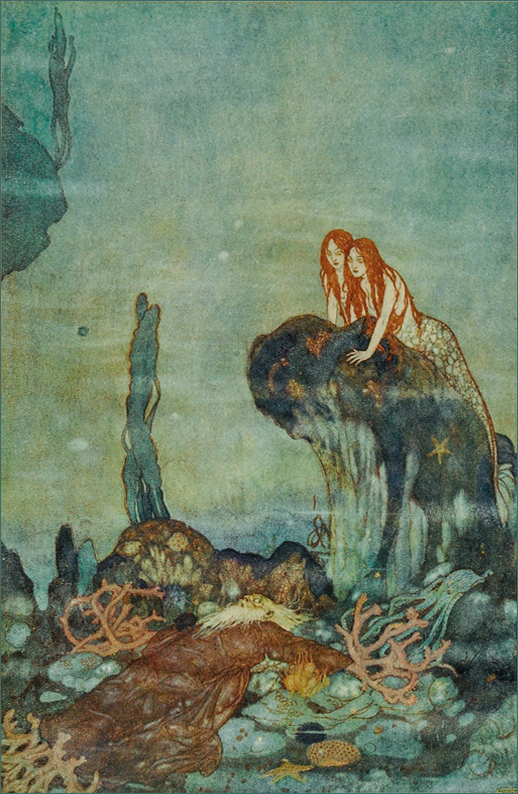 By a strange coincidence, I had seen ‘The Tempest’ at the Barbican during the same week, and so I would like to leave you with Ariel’s song from the play. 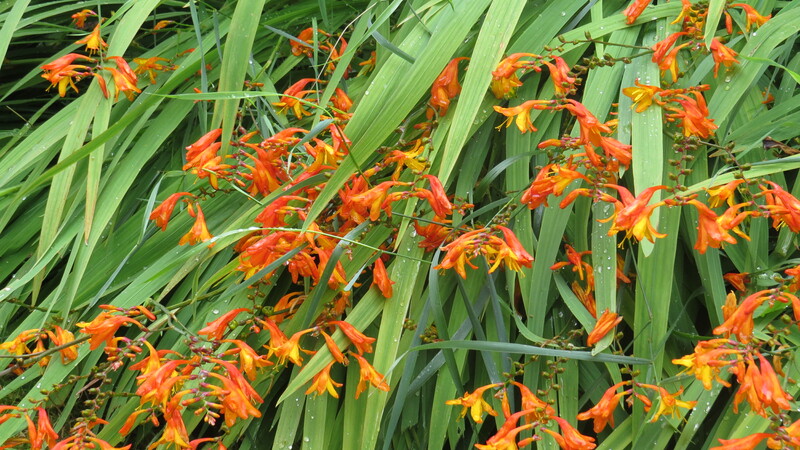 Everything is in flux, everything is connected: a botanist combines two South African plants that are now flourishing on the west coast of Ireland, overlooking the Atlantic where HMS Montbretia met her end. Metal hewn from the earth is made into a ship to serve in the wars of men, and that same ship is now probably a reef, busy with fish. One day we, too, will return to our constituent minerals and our atoms will make other creatures and plants. Nothing is wasted, if we take the long view. And some days, i find that strangely comforting. This entry was posted in London Plants on August 9, 2017 by Bug Woman. How interesting, Alittlebitoutoffocus – I think the Navy missed a trick with naming the destroyers. They could have been called Quince or Quirky or Quack for example :-). I’m intrigued about the memoir – how lovely to have turned them into a book! I’ve been recording my parents and their stories with a similar thought in mind…. As a result of that, my dad is really looking forward to seeing the website and maybe recognising some of the names or diary entries. So I’m working on a way to show him all that (as he hasn’t got internet access) by downloading the text and images to an offline Word type document for when I return to the UK in 2 weeks. It’s amazing how Montbretia brought this to our attention, so thanks again from me and my dad! Mike, what a lovely story – I’m always amazed by where the blog leads me, and delighted when it connects with people! The HMS Quality website looks fascinating – could you just print directly from the website I wonder? I know that sometimes the pages end up a bit peculiar, but it would save some of the messing about. Might be worth a try, if you haven’t thought of it already (which you probably have 🙂 ). I hope your dad enjoys it, and I’m very happy to have been of service…. I am guessing that mine will perk up after the two solid days of downpour then! What interesting bye-ways you find for us, I would never have expected a connection to ships. And, another blog to investigate – Alittlebitoutoffocus, Thank you Vivienne.